BARGAIN PRICE FOR A QUICK SALE! 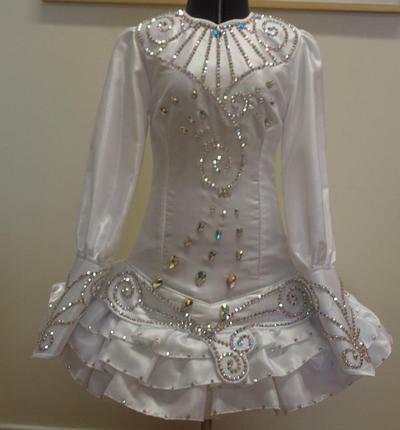 This dress was individually designed and made for the Australian Nationals in October 2011 by Doire Designs/Shauna Shiels. 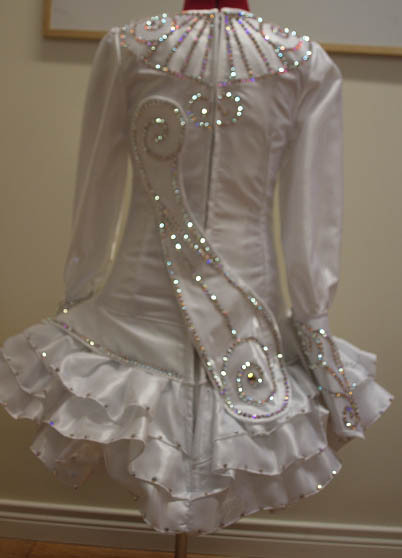 The fabric used was white satin overlayed with organza for the dress as well as the cape. The underskirt is lined with black fabric. The dress has excellent stage presence  it really sparkles due to the varying sizes and the thousands of swarovski crystal diamantes which make up the unique design. 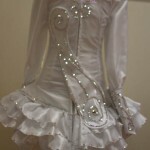 The dress has a soft white satin cape which is also covered in hundreds of swirls of crystals. Black lycra bloomers and headband are included. The dress has had only 1 owner. The dress is in very good condition  there some marks on the inside of the neck & edge of sleeves. This dress comes from a smoke free home. Asking Price: $1300 AUD or near offer. Postage is included. The sale is final.